Yesterday, Flower Mound residents were reporting burning eyes, headaches, sore throats and bloody noses and, according to hearsay, one medical professional said these recent complaints were in record breaking numbers. So I decided to see what I could see with the FLIR GF 320 camera. It’s no wonder Flower Mound residents are complaining. I started complaining about 30 minutes after arrival and stopped complaining about 30 minutes after leaving. Everywhere is a gas well pad site and as production dwindles, lift compressors are added to the equipment on each site. These compressors are permitted as a separate source of pollution–an additional 25 tons of volatile organic compounds per year. First I took video at the Hilliard Unit which is very close to two schools and is surrounded by very lovely homes. I couldn’t get close to this facility but was still able to pick up emissions. Next was the infamous Bunn Unit. This is another facility that is way too close to a school and neighborhoods. Next was the Sam Wilson facility on Scenic Dr. We saw the craziest thing here. From the piece of equipment in the photo below, that looks like some kind of incendiary device, we saw wet looking vapors shooting up about 15′ high. I got out of the vehicle as fast as I could but not fast enough to capture it on video. Whatever it was stank horribly and made my throat swell. The Sam Wilson Unit and Compressor Station is another infamous facility that never fails to preform. This same facility had the huge methane plume when Piccaro did the Methane Mapping. And then the Bob Smith. If I remember correctly, “Shiloh Chris” lives nearby. 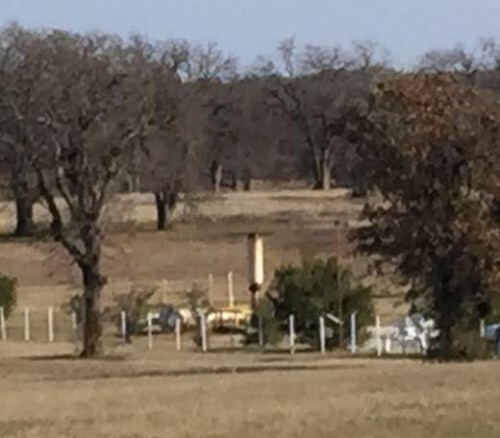 You might have thought that Flower Mound’s fracking problems were all over because of their 1500′ setback. No so, apparently. Update: Let me add that I am a certified Optical Gas Imaging Thermographer. I have the same certification the TCEQ and industry has and I was certified by the same instructor who certifies them. So I always get a kick out of it when good-old-boys say the FLIR GF 320 camera is only picking up heat. This was sent to me via text. It’s probably from the Flower Mound Cares Facebook page <-shudder->. The FLIR GF 320 camera does detect heat but it does not detect hot air as THIS VIDEO shows. 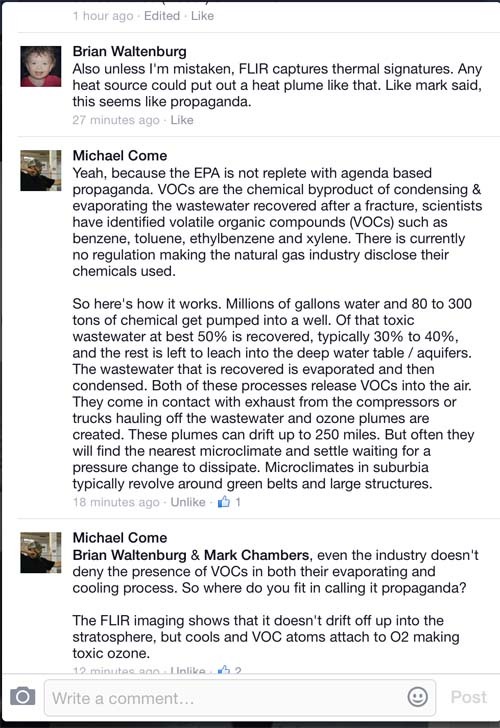 The plume that you see trailing off in the videos is VOCs. And just to be clear: The spurting fountain of likely toxic air pollution is a concern but the ongoing emissions from the compressor station and lift compressors are, IMO, a larger concern. Happy New Year Sharon, your earthquake and emissions posts are excellent! Thank you for continuing to connect all these important dots for people and communities – and a huge congratulations on your Optical Gas Imaging Thermographer certification. You’re such a doer! Way to go! Happy New Year to you, Neighbor. Five Liquefied Natural Gas (LNG) operations are targeting the Port of Brownsville, next door to South Padre Island. Look for “saveRGVfromLNG” on Facebook (RGV = Rio Grande Valley). One of the companies, Rio Grande LNG (http://www.riograndelng.com/) has scheduled Open Houses in Kingsville (Tue 05-19), Raymondville (Wed 05-20) & Brownsville (Thur 05-21-2015): http://www.valleymorningstar.com/news/local_news/article_397be0b6-faaf-11e4-bfe2-c75ef8558c93.html. They plan to build a 140 mile natural gas pipeline from the northwest side of Kingsville through the Raymondville & Brownsville areas to the Port. They’re probably talking up Texas A&M at Kingsville about future LNG related jobs for its graduates. According to the LNG companies, all of this is all good — all upside with no downside. We’re focused less on fracking issues than on immediate local concerns such as the negative effects of emissions on human health, the threat to ecotourism related jobs, the increase in electric rates we can expect from the exporting of natural gas, etc. However we emphasize that TCEQ has failed fracked communities and so cannot be counted on for any effective oversight of any of these operations. We also point out that exporting LNG from our local Port can only encourage water-intensive fracking of northern Mexico’s Burgos Basin only 100 or so miles south of us, that there are claims that Burgos promises up to 8 times the production from Eagle Ford, and that, because there is no international US-Mexico agreement regarding the aquifer we share, Mexico could severely cut into our water supply (Raymondville being at the end of water pipeline recently had to develop alternative water sources). What would you say to our local folks who think TCEQ will adequately monitor and protect us from all this? Maybe post a comment on our saveRGVfromLNG Facebook page? Do I have news for the folks who think TCEQ will do anything to protect the people. I just put this comment on the Facebook page but it’s only available by looking over on the left side. Do not expect help with emissions from TCEQ. This is only one of the many examples of malfeasance by the TCEQ. http://www.texassharon.com/2015/04/13/tceq-refused-to-respond-while-this-air-pollution-traveled-20-miles/ The reason our legislators passed HB40 was to give the oil and gas industry a green light to frack in our backyards. The reason they have to frack in our backyards is so they can pulverize every inch of the shale for LNG exports. We are all in this together. Your problems are mine and mine are yours.